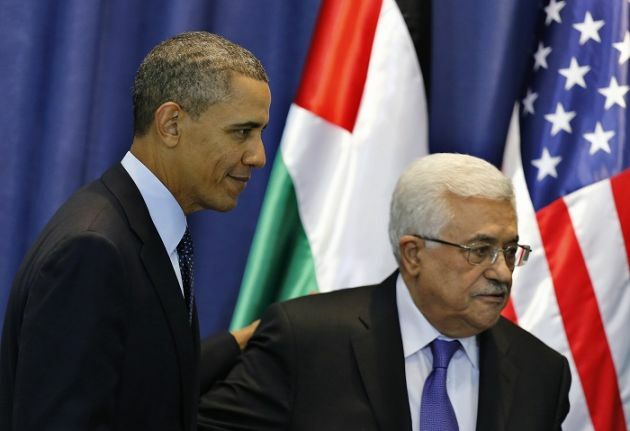 (Photo: Reuters / Ammar Awad)U.S. President Barack Obama (L) and Palestinian President Mahmoud Abbas leave after a joint news conference at the Muqata presidential compound in the West Bank city of Ramallah March 21, 2013. Obama said on Thursday that settlement building in the occupied West Bank did not "advance the cause of peace", but stopped short of demanding a construction freeze to enable negotiations to resume. Pope Francis' canonization of two 19th-century nuns from Palestine was to encourage beleaguered Middle East Christians coming soon after the Vatican acted to formally recognize the Palestinian area as a State. Francis made Sister Mariam Baouardy, who founded a Carmelite convent in Bethlehem, and Sister Marie Alphonsine Ghattas, who started founded a congregation of nuns saint for their work in what was then part of the Ottoman Empire. Sisters Mariam and Marie Alphonsine were among four nuns canonized during at a Sunday Mass in St. Peter's Square watched by Palestinian President Mahmoud Abbas and some 2,000 pilgrims from the region. They were the first saints from the Holy Land since Christianity's early years. Vatican officials had said May 15 that the canonization of the women was not related to the Vatican's announcement of a new treaty to be signed with the Palestinians. Sunday's ceremony followed a meeting between Pope Francis - who visited both Israel and the occupied West Bank a year ago - and Abbas at the Vatican the day before. The Vatican confirmed it had concluded a treaty which effectively recognises Palestinian Statehood and action which Israel has criticised saying such recognition forestalls peace negotiations. The Catholic Church's celebration of the two new women saints from Palestine helps recognize both women's important role in Arab culture and Arabs' important role in Christianity, said The Catholic World Report. "These two humble and simple women, consecrated women, give us also encouragement to pray for peace," said Father Rifat Bader, general director of the Catholic Center for Studies and Media in Amman, Jordan. He attended the May 17 canonizations of Saints Mariam Baouardy and Marie Alphonsine Danil Ghattas in Rome. Marie Alphonsine herself called for prayer of the Rosary "for peace and tranquility in our region," Bader told Catholic News Agency ahead of the event. St. Marie Alphonsine was born in Jerusalem dedicating her life to women's education leaving behind convents, schools and religious centers, known as the Rosary Sisters. She died, aged 80, in 1927 in the British Mandate Palestine. St. Mariam Bauardy, was born 1846 in what is now Israel's Galillee region in the village of Ibillin and died in Bethlehem in 1878 after establishing a Carmelite convent in Bethlehem where her body lies buried nearby. The sainthood for these two women, said Bader, is "a good example for all the citizens," Muslims, Jews, and Christians alike. The canonizations show "that the woman can do positive and good things in her society." "It's very important issue to talk about the mission, or the role, of women in our Arab countries," Bader said, noting that the importance of role of a woman within society and within her own family is not always recognized.